This app removes all the contact data for your Android device. 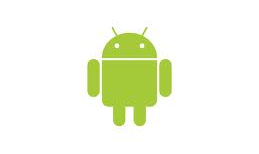 It can help, for example, if you sell or buy a second-hand Android phone where you want to wipe all data. Beware and please use accordingly and carefully, even if this feature is secured first with a start button, and then a confirmation dialog box ! The app proceed first with a global delete if it's possible, then complete it with a one-by-one approach if necessary. This approach should solve all problems related with contact data : for example, on one of our friend's smartphone, it helped destroying "stuck" SIM card contacts which couldn't be deleted with the contact interface. 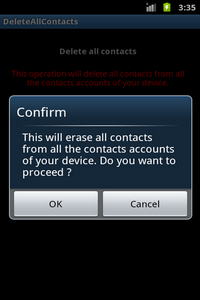 From 1.1.10 version to above, DeleteAllContacts works from Android 2.3 to 8.x devices. DeleteAllContacts has been tested on Android 1.6, 2.x, 3.x, 4.x, 5.x, 6.x, 7.x devices. Tests on Android 8.x are currently in progress, but as the early results show, the app should work fine too.